Should You Coat Glass During Construction? The problem of delayed closings on construction projects due to damaged glass surfaces is a growing one. Millions of dollars are lost each year as owners force builders to replace defaced glass surfaces. 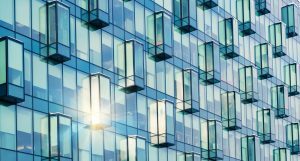 Many contractors seem unaware that normal building operations can be detrimental to the appearance of installed glass on the site. Frequently, contractors must complete areas such as windowed walls and glass enclosures before they finish other parts of the structure. This situation can leave glass surfaces exposed to all types of abrasive or otherwise damaging elements. Various methods have been tried in the past to ameliorate the problem including the application of adhesive films. However, until recently, there were no readily available effective window glass protective coatings. When the unprotected glass is exposed to paint, concrete sealer, wood stain, stucco and a variety of other substances regularly found on a job site, cleaning the glass will not return it to its original condition. Even with professional glass cleaning, the results are usually unsatisfactory. The glass is typically either scratched from being exposed to the harmful environment or during the cleaning process. Other adverse environmental factors such as dust and moisture can also result in contractors having to replace glass surfaces. An industry has developed around attempting to protect glass and prevent the fruitless cleaning attempts and expensive replacements. At first, adhesive films were the best solution available. This protection method had its share of problems. One issue was the tendency for the coatings to detach from the glass after a short time and begin to peel. This condition left the glass exposed to damage once again. Lately, manufacturers of window glass protective coatings have developed products designed for application to the glass surface as a liquid. The substance adheres tightly to the glass and protects the surface from all of the detrimental aspects of an unfinished building site. When the job is near completion, the coating is peeled from the glass and disposed of as construction debris. The glass is protected through the most active phases of construction when damage is most likely and presented to the owner in pristine condition.